← Congratulations, Linden Lodge Foundation! 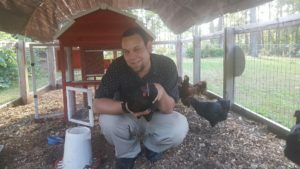 Linden Lodge residents each care for one chicken that they “adopted” and clean the chicken coop daily as a way to promote their personal responsibility in addition to having the fun of gathering our fresh eggs each day. No one can say our residents are not a creative bunch as the names of our chickens are Zeblow, Roseanna, Popcorn, Georgie Mae, Ruby, Crystal and Cuckoo. Life continues to be good at Linden Lodge!! This entry was posted in Community Outreach, Latest Posts. Bookmark the permalink.